Kalen ceased walking, considering whether to reply or not. “You know the southern lands better than me and you’re memory spans generations. I need you to help me find what I’m after.” Kalen recommenced trudging along the overgrown path, chopping away at the thicker weeds that penetrated the ancient merchant road with one hand, holding his war spear on his shoulder with the other. Tomaz shrugged his bronze shoulders, accompanied by the faint whir of cogwheels and squeak of hinges, and dutifully followed. They walked the abandoned road for a few more hours without speaking. Tomaz could sense Kalen wasn’t in the mood to talk and saw little point in starting a conversation. He observed that the old warrior was tiring, a sensation he hadn’t felt for nearly thirty years—since his living heart was transferred into the Autómatos—when he became the Autómatos. Kalen found a suitable clearing on a grassy knoll, and set camp. Tomaz stood nearby, appearing more like a sentry than a travelling companion, as he needed no sustenance, nor did he require shelter from the elements. “What specific help do you need from me?” he asked, after Kalen finished supping on several chunks of preserved meat, washed down with apple cider from a skin. Kalen clamped his mouth shut. Tomaz cast his mind back to a time when the summer was particularly hot and blustery. It was when he and Kalen were young and zealously sought to taste the rawness of life in war. The excitement of hand-to-hand combat, punctuated with episodes of despair. The exultation of victory, the enduring warmth of comradeship, and the horror of death. Whenever he reviewed his own human past, his recollections drew him ever toward the moment in that summer when he was viciously struck down by an enemy horseman, and felt his life-blood—his soul—slowly seep away. Despite his deathly delirium, Tomaz had memory flashes of Kalen picking him up, carrying him four miles under an oppressive sun back to their city, and being told that he was the luckiest of all men—that the Holy Autómatos’ cycle of ninety-nine years was nearing its conclusion and that another Host was required. It was a hot mid-morning when the unlikely pair left the ruined Southern Road and trekked over the rugged lands once known as the Kzan. 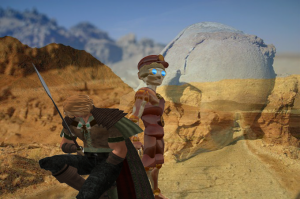 Kalen and Tomaz spent several hours crossing deep gullies, and climbed into a small valley among the Kzanir Hills. “I have a question,” Tomaz announced. Tomaz was in clear sight of the Hierodont’s lair and was asked to wait and observe at this safe distance. Kalen donned light armour—covering his chest and groin, upper legs and arms. He firmly grasped his spear, and tramped purposefully toward the cave entrance that was the Hierodont’s home. As he entered the large clearing that lay before the cave, he had to watch his step, as the hard, dusty ground was strewn with loose and half-buried bones—animal as well as human. Many of the remains were very old. Some of the sunken skulls seemed to surreptitiously peer at him through worn, black sockets, accusing him of foolhardiness and vainglory. A roar emanated from the high cavern entrance. Kalen was twenty yards away. He swallowed hard. Dust picked up from the shadows, and a human-shaped creature jumped into the open. It was three times the height of a tall man, muscles rippling and strangely brown in hue with skin as thick as an elephant’s. Foot long talons stretched from each finger and toe, and longer, sharper canines jutted from its mad mouth. Its face was an enlarged parody of a human’s, distorted due to its thick hide which covered its entire head. Matted, sparse hair, much like a horse’s mane, dangled to its shoulders. The Hierodont stamped its right foot and rushed toward Kalen. The warrior held his spear halfway up the shaft, pointing the spearhead upward. He could quickly brace the spear into the ground against a charging body, or move as easily into a dozen other offensive and defensive positions. Kalen trusted the shaft completely—it was made by his father for his fifteenth birthday, and it had never failed him. There were notches on the treated wood from countless axe and sword blows, and yet it never once yielded to metal. The Hierodont sensed the prowess of the puny human before him, causing it to suddenly break, kicking more dust into the air. It stood four yards before Kalen, thumping its chest, and roaring so loud birds scattered from their perches from distant trees. It eyed the spear like it was a puny rose thorn. The Hierodont roared again and lunged forward, skilfully turning its body sideways to force Kalen to adjust his spear stance. Kalen had no chance to target the creature’s navel and jumped back while repositioning his spear in defensive mode. The Hierodont swung its long arm at Kalen’s head with astonishing swiftness—it was only Kalen’s quick thinking to leap back that kept his head from leaving his body. The Hierodont faced Kalen again. Before the warrior could thrust his spear with all his might at the fist-sized navel, the creature swung its left clawed hand with supernatural speed in a downward action. Without thought, just relying on training and battle experience over three decades, Kalen flipped his spear sideways to block the blow. The strike was so hard it knocked Kalen to his knees and for the first time in its thirty-five year existence, the spear snapped in half with a loud crack. Kalen held onto the half of the spear that still had the spearhead, rolling as quickly as he could to his left. He heard and felt the stomp on the ground where he had knelt only a split second before. Kalen rolled straight to his feet at the Hierodont’s flank. The warrior knew that this was his last chance. Before the beast had a chance to twist its body, Kalen roared a battle cry and jumped high onto the Hierodont’s torso, avoiding the razor-sharp claws. With his left arm clamping his body against the foul smelling creature, he screamed his war cry a second time and used every ounce of his strength to stab the spear head deeply into its body. As the Hierodont’s claws cut savagely into Kalen’s back, the spear—aided with the strength of the creature’s own arm closing in—slid effortlessly through the beast’s navel, practically swallowing the blade and half-shaft. Kalen was pinned by eight dagger-like claws, tightly to the Hierodont. The creature howled in pain and crumpled to its knees. Kalen blacked out, hanging limply like a marionette. The Hierodont’s eyes rolled back as its vital organs rapidly shut down, and it lurched forward, seemingly to crush Kalen beneath it. “Not today,” muttered the Autómatos, having closed in on the embracing combatants. Tomaz pushed the Hierodont hard, forcing the crumpling creature to pivot and fall heavily to its right. “Oh, Kalen, my dear friend!” came Tomaz’ ringing whimper, after extracting and checking the stricken warrior. Eight deep, bloody wounds covered the spearman’s back. A few had passed through his chest. Kalen’s eyes fluttered open. “Is it dead?” he feebly asked, blood running from the corners of his mouth. Kalen smiled. An overwhelming weariness overcame him, and his eyelids shut like trap doors. The Elder Council’s meeting was interrupted by shouting outside the multicolumn building, and running footsteps echoing from its entrance hallway. “Who dares interrupt the sanctity of our assembly?” blasted the most senior of the Elders at the table, standing in outrage. “What?” cried the five counsellors in unison. They flooded to the hallway, hoping to glimpse their adored conduit to the gods, and who served as the magistrate of the city and Chief of the Council of Elders. Ascending the stone steps, with a wake of ten thousand citizens behind him, was the Autómatos, carrying the limp body of Kalen across its arms. The counsellors all bowed and rushed into the hallway, leaving the Autómatos to complete the journey to the hexagonal chamber. “You now have your legacy, friend,” he said gently, as the cogs and wheels continued their work powering the Autómatos’ legs up the marble stairs.